Please join me in welcoming guest blogger, Teresa, as she shares her Nifty Fifty quilting group and charity. An awesome group that has accomplished so much. I created the Nifty Fifty state quilt block swaps which also make charity quilts for Breast Cancer Awareness. I live in Virginia and I have been quilting for almost 20 years. I love to hand piece and hand quilt. I do all my appliqué by hand including the 50 state quilt blocks that I have made in the past. 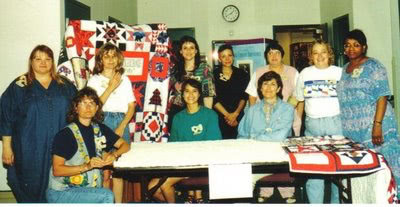 In 1995 my quilting pen pal and I started a centralized 50 state quilt block swap. I represented the state of Virginia and while making my 50 Virginia state quilt blocks (all hand pieced) I thought how easy it would be to make a couple more quilt blocks for charity. So I requested our quilters to make two extra quilt blocks. We decided to use one quilt block for a charity quilt and one for a museum quilt. As a group of women we voted to make our charity quilt for Breast Cancer Research since this disease touches so many women’s lives. 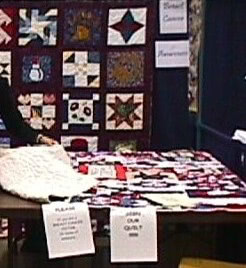 The museum quilt would be used to collect signatures of breast cancer survivors and victims. After our first successful swap, our groups continued on and we decided to name our groups the Nifty Fifty Quilters. There have been 28 successful and completed Nifty Fifty swaps with each swap making one or more Breast Cancer Charity Quilts. Each swap had its own hostess who followed our standard Nifty Fifty Guidelines. 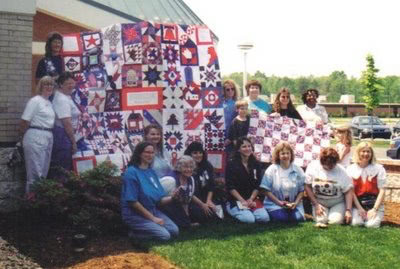 Original Nifty Fifty Quilters collecting signatures on Nifty Fifty Survivor/Memorial Breast Cancer Quilts in Virginia in 1999. The color theme for our first two Nifty Fifty swaps was burgundy, forest green and cream. Then as the groups grew so did our themes. 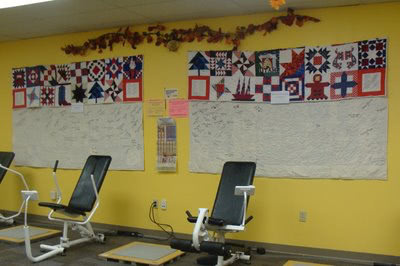 Some of our most memorable themes were Sunbonnet Sue, Batik, 1930 Repro, Civil War, State Flowers, Redwork, Native American, Patriotic in Remembrance of September 11, 2001, Carol Doak’s paper pieced stars, Amish and Snowflakes. These swaps have made thirty-two charity quilts. Each of these charity quilts has been donated by their hostesses to local hospitals to raise money for breast cancer awareness. Our Twenty Plenty International swaps, which also follow the same guidelines as our Nifty Fifty swaps, have completed five breast cancer charity quilts. I decided a few years ago to make both Nifty Fifty One original charity and museum quilts into Breast Cancer Survivor/Memorial Quilts. They can be borrowed by quilt guilds and quilting groups to be displayed at their quilt events and to collect signatures on the back. They were last displayed this past year in Stafford, Virginia at our local Curves during the month October. Nifty Fifty Survivor/Memorial Breast Cancer Quilts collecting Signatures at Curves in Stafford, Virginia in 2009. Our Nifty Fifty Quilting groups are still continuing with our Butterfly Themed Swap and our Amish Themed Swap. These groups will also be making breast cancer charity quilts. I am in the process of documenting all our Nifty Fifty Swaps and their charity quilts. I am making a web site for each of the 50 states which will feature all the individual state blocks together. View some of my finished state pages. At this time, our swaps documented on our web site with each swap’s 50 state quilt blocks and charity quilts featured by themes. You can view these quilts and individual quilt blocks from links on our Nifty Fifty Photo Gallery page. Several Nifty Fifty One Quilts on display while our group was sorting the international quilt blocks and sewing the charity quilts together. In memory of one of Nifty Fifty hostesses who lost her fight to Breast Cancer we have made a Nifty Fifty Survivor/Memorial page. We are collecting inspirational and special stories of breast cancer survivors or stories from family members or friends who have lost a loved one to breast cancer. Please visit our Survivor/Memorial page. 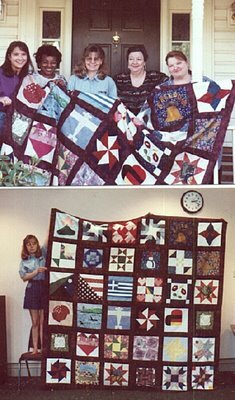 You can learn more about the history of our groups or visit our main Nifty Fifty Quilters page. Congratulations ! What a wonderful way to make a difference. I encourage everyone to check out the state pages. The quilters in my home state of Florida made some great blocks. Thank you! Thank you for enjoying our pages. I am still in the process of building the state pages. It is very interesting to see all the individual state blocks up together on one page.